Olympic gold medalists Kerri Walsh and Phil Dalhausser, along with the United States’ No. 2 women’s team, Jen Kessy and April Ross, all played in the National Volleyball League’s (NVL) Miami Beach event last September. Kessy and Ross won the women’s competition, but the NVL scored the real victory by getting all the players in the same place. This week Kessy and Ross return, along with Dalhausser and 2008 gold medalist Todd Rogers, as the teams open NVL’s season at Baltimore Beach. The competition then moves to the infield of Pimlico Race Course, where the Preakness will be held Saturday. Kessy and Ross and Dalhausser and Rogers have qualified for the London Olympics. The Association of Volleyball Professionals (AVP) Tour went bankrupt in 2010, leaving the United States, the defending Olympic gold medalists in both men’s and women’s beach volleyball, without a domestic tour. In its wake came the NVL, the brainchild of 42-year-old Albert Hannemann, an 18-year beach volleyball veteran. Hannemann wanted a tour for the players, created by the players that filled the holes that ultimately sank the AVP. That meant starting smaller, keeping costs down, and building up from the grassroots. Being one of the best self-promoters as a player, Hannemann found some sponsors to get the league going. Now the task is getting more. That comes from consistently getting the top players to play. With the star players come more sponsors. The NVL announced sponsorships with Asics and Club Med this week. In addition, amid the music and the roughly 100,000 fans at Pimlico , the NVL will host its event’s semifinals and finals. It’s the second consecutive year the NVL will be at Pimlico. By partnering with a larger event, the NVL gets a built-in crowd and cuts costs by only having to pay for the volleyball-related expenses. 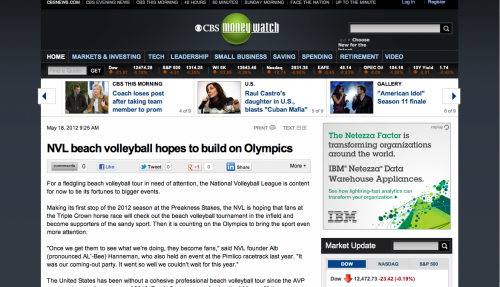 But the NVL isn’t alone in its quest to grab the U.S. beach volleyball market. The Jose Cuervo Beach Volleyball Tour started around the same time of the NVL and the AVP, under new ownership, plans to make a return soon. With a fight for the stars possibly on the horizon, it helps that Hannemann is a former player. “Right when we heard about (the NVL), we were going to support it, because it was run by a player, because he kind of knew what the players wanted,” Kessy said. Hannemann says more than one domestic tour can survive, simply because everybody is doing something different. He says, the NVL for example, is thinking long term. The league has partnered with junior volleyball events and Smith’s NCVSA College Tour, which provides college students the opportunity to compete in regionals around the country. “The grassroots is something the AVP never really cared about,” Hannemann said.